Berthold Löffler (1874 Nieder-Rosenthal, Bohemia--1960 Vienna) studied at the school of the Gewerbemuseum (Craft Museum) in Reichenberg, in his native Bohemia, before moving to Vienna to study at the Kunstgewerbeschule (School of Arts and Crafts), where he eventually became a professor. He was a central figure in the later development of the Wiener Werkstätte (Vienna Workshop), the art and design collective founded in 1903 by Josef Hoffmann and Koloman Moser, that pursued the ideal of the Gesamtkunstwerk (total artwork), a unification of artists and craftsmen of different disciplines in the creation of an overarching lifestyle concept. Early in his career, Löffler worked independently as a painter and illustrator and also began to experiment with ceramics. In 1906, he founded the firm Wiener Keramik (Vienna Ceramics) with fellow-artist Michael Powolny. The firm contributed tiles to the Wiener Werkstätte’s Palais Stoclet in Brussels (1905-1911), and, from around 1907 on, the Werkstätte assumed distribution and sales of Wiener Keramik. The Keramik’s figurative pieces sold exceptionally well in the Werkstätte’s shops. Löffler and the Keramik were also significant contributors to the Werkstätte’s Cabaret Fledermaus in Vienna, designing the colorful patchwork of decorative tiles covering the walls of the barroom. Löffler designed a well-known poster for the Cabaret, as well as contributing graphics for its program and stationery, among other things. In 1912, the Wiener Keramik merged with the Künstlerische Werkstätte (Artistic Workshop) Franz und Emilie Schleiss in Gmunden, forming the Vereinigte Wiener und Gmundner Keramik und Tonwarenfabrik Schleiss Gesellschaft (United Vienna and Gmunden Ceramics and Gmunden Earthenware Factory Schleiss). Gmundner Keramik is still in operation today. Despite his involvement in the WienerKeramik, Löffler was primarily a graphic artist. He was involved with the 1908 "Kunstschau" (Art Show), which highlighted the Wiener Werkstätte and the Klimtgruppe (Klimt Group)—a group of artists, led by Gustav Klimt, that had broken away from the Secession. For the exhibition, Löffler designed a display of contemporary graphics (covering the gallery’s walls from floor to ceiling) and an iconic poster, among other contributions. 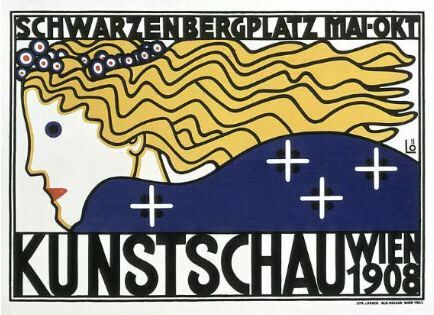 He also designed postcards for the Werkstätte’s series of nearly one thousand numbered artists’ cards, in addition to Werkstätte jewelry and other products. Löffler and the Wiener Keramik are associated with a stylistic shift at the Werkstätte, from the geometry associated with Hoffmann and Moser in its early years to a more decorative sensibility, as well as a renewed focus on the use of the human figure.